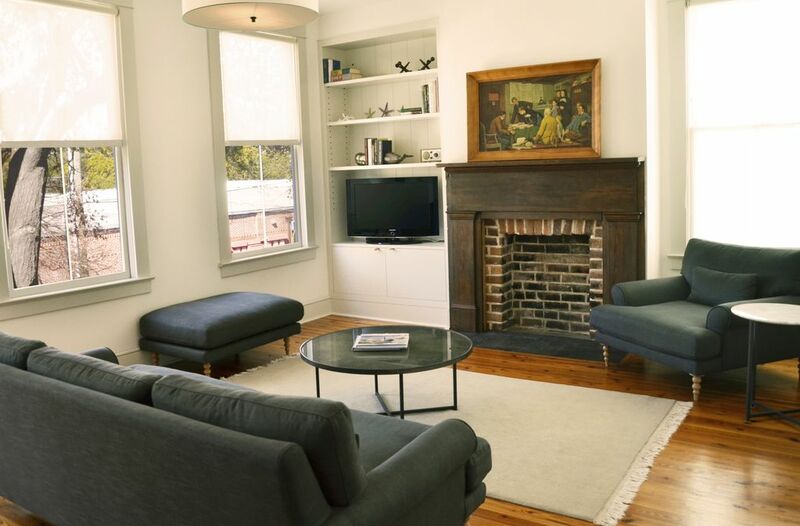 A luxury retreat from which to explore historic Savannah or to simply relax in true Southern comfort, this home is conveniently located on Crawford Square, one of twenty-two original squares in Savannah’s true historic district. Situated near the river, 218 Houston is just a short stroll to Forsyth Park and all of Savannah’s fine dining and cultural institutions. Built in 1900 and recently renovated in detail, this 2 bedroom 1 ½ bath condo offers the finest appointments and modern amenities. With more than 1300 sq ft, the home allows for maximum comfort and privacy. The main level provides an open floor plan great for entertaining. Two bedroom suites and full bath are tucked away on the upper level providing ample room for four guests. A half bath is also located on the main level of the home. Vintage and contemporary furnishings create a relaxing retreat with provenance. Golden heart pine floors shine throughout. Oversized windows flood the home with natural light and provide amazing views of moss covered live oaks and the surrounding architectural landscape. The spacious living room offers a comfortable sofa and two lounge chairs—a perfect place to relax. A restored heart pine mantle frames the original fireplace. The home is well equipped with a 32” LCD TV, DVD player, HD digital cable (with HBO), and assorted Savannah and classic DVD's. Listen to your own digital music with our convenient entertainment system. Secure wireless internet and local and long distance phone service are provided. The kitchen is fully furnished with Kitchen Aid stainless steel appliances—electric range, microwave, refrigerator, dishwasher and rich granite countertops. Prepare gourmet meals or enjoy a morning cup of coffee. All utensils are provided for your cooking needs including Cuisinart stainless cookware and place settings for eight. Seating for six in the dining area with original fireplace and period mantle. The master suite features a queen bed with deluxe memory foam mattress, fine quality linens, ample storage, and vintage bench. A pocket door provides direct access to the bath. Indulge your senses in our spa inspired bath. Surround yourself with natural, honed slate. Relax from a hectic day or revive from a restful nights sleep in our oversized shower with complimentary Malin+Goetz products including shampoo, conditioner, soaps, body lotion, mouth wash and luxurious bath towels. A front loading washer and dryer are conveniently located within the bath. The guest suite features a queen bed with deluxe memory foam mattress, fine quality linens, lacquered parsons desk and vintage lounge. The suite also includes a dormered window seat with treetop views of historic Savannah and the frequent riverfront fireworks. Local maps and personalized guide books are provided to acquaint you with all Savannah has to offer! Parking for this property is on-street and metered, which is enforced by the City of Savannah from 8am to 8pm, Monday through Saturday. For added convenience guests can purchase a prepaid parking pass from the Savannah Visitor's Center - applicable to any metered spot or city-owned parking garage. Guests can always pay directly through the electronic meter or use Savannah's Parking app via their phone. 218 Houston is designed as the ultimate getaway experience offering a blend of old and new, crisp modern aesthetics, and the finest materials. We take great pride in our home away from home and hope you will enjoy it as much as we do! Great place- roomy, quiet, well appointed and convenient. We loved the location and the apartment was modern, nice and super clean! Jordan called the day before to make sure we didn’t need anything! The house was perfect! This is a great location, close enough to walk to River Street, Forsyth Park and wandering through all the lovely Squares. Still far enough to be away from the noise and crowds. Savannah is a really lovely city will definitely return. Jordan and Casey were very helpful answered our questions promptly. It was truly a wonderful experience. This was our first visit to Savannah but I am certain it will not be the last. Upon arrival we were very pleased with the comfortable and modern appearance of the home. It did.not take long to find that the kitchen is fully equiped and convenient. In addition to a wonderful place to stay the location made it very easy to explore the entire histiric district on foot. I am sure we will return! We had a fantastic stay and the house is really nice. It’s in a great location and everything is updated. Couldn’t say enough how much we enjoyed it.